AP EdCET (B.Ed) 2017 Hall ticket/ Admit card download AP EdCET 2017 Hall Tickets Download http://sche.ap.gov.in/EDCET AP Ed.CET 2017 Education Common Entrance Test ( Conducted By Andhra University, Visakhapatnam on behalf of APSCHE ) AP EdCET 2017 Hall Tickets Download. AP B Ed Entrance Test 2017 Admit cards Download. Online AP EdCET 2017 Hall Tickets Download. 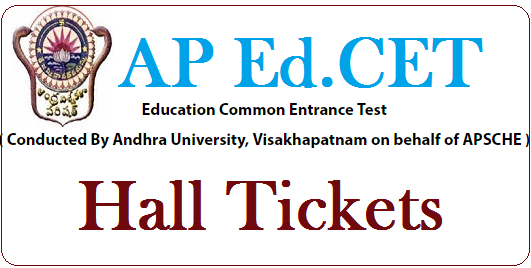 AP B Ed Entrance Test 2017 Hall Tickets Download at apedcet.org. http://sche.ap.gov.in/ AP Education Entrance Test 2017 hall Tickets ,B Ed Hall tickets 2017, Andhra Pradesh EdCET 2017 Hall Tickets Download . Andhra Pradesh Education Common Entrance Test 2017 will be conducted by Andhra University, Visakhapatnam for admission to 2-year regular B.Ed course, will be announced the admit cards of entrance examination. Eligible candidates can download for hall ticket through official link. Candidates must keep ready the login information such as registration number and date of birth.